Needlepoint. 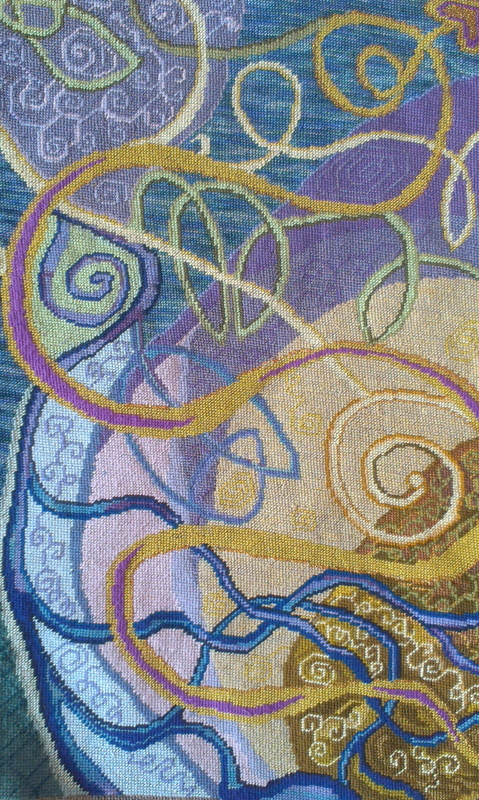 A mixture of tapestry and knitting wools on a rough hessian canvas. Stitched October – December 2012. Inspired by Celtic knots and the sacred imagery of the spiral. It also has the look of the sea about it – the slightly diagonal blue-green lines in the upper right and the spirals of sea plants and chambered nautilus. What do you do with your pieces when they’re finished? Do you frame and hang them? Do you show them? They are really beautiful. Well, the truth is, that until about 6 months ago, they were all just piled up on a shelf, but I’m now beginning to show them, and I’ve even sold a few, so some are mounted for hanging. I’m preparing for my next exhibition in June. Wish I could be there, but I live in the middle of the US. Please post photos when that happens, ok?